Maybe the biggest, most pleasant surprise of 2017 was Happy Death Day. The Groundhog Day-by-way-of-teen-slasher horror flick turned out to be one of the most enjoyable, entertaining movies of the year, delivering clever thrills and a sharp, smart take on the conceit. Produced on the cheap by Blumhouse, and raking in $122 million on a $4.8 million budget, a sequel was inevitable. And that sequel, the appropriately ridiculously titled Happy Death Day 2U, arrives on Valentine’s Day and there’s a new trailer to hype it up. Happy Death Day follows college student Tree Gelbman (Jessica Rothe), a snotty sorority princess who, when she’s murdered on her birthday, wakes up, alive, to live the day over. Dying over and over again, she uses her multiple lives to solve the mystery of her own death and hopefully break the cycle. As one might imagine, the sequel picks up with a similar concept. From this Happy Death Day 2U trailer, it appears Tree wasn’t quite as successful in breaking out of the endless repetition as she thought. This time around, the murder circle expands and encompasses her friends, so she has to figure out a way to save them as well. Jessica Rothe leads the returning cast of HAPPY DEATH DAY 2U, the follow-up to Blumhouse’s (Split, Get Out, The Purge series) surprise 2017 smash hit of riveting, repeating twists and comic turns. This time, our hero Tree Gelbman (Rothe) discovers that dying over and over was surprisingly easier than the dangers that lie ahead. What we see in this trailer shows off the same mix of humor, horror, and tongue-in-cheek self-referential asides that made the first movie so much delightful. 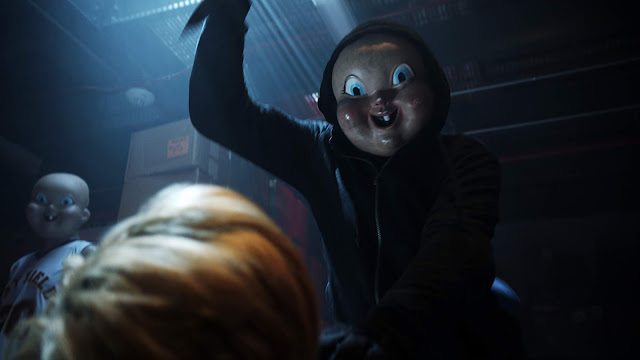 Hopefully returning writer/director Christopher Landon can capture what makes Happy Death Day so much better than the cheap throwaway teen horror it looked like. This ain’t no Truth or Dare. Happy Death Day 2U opens everywhere on Valentine’s Day, February 14, 2019.